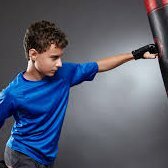 Kids learn kickboxing, ethics, discipline and self defense in this engaging class. Rank and progression tests help your child continue to grow and mature. Plus they get a great workout! This class is held once per week. Please check you location schedule for details.